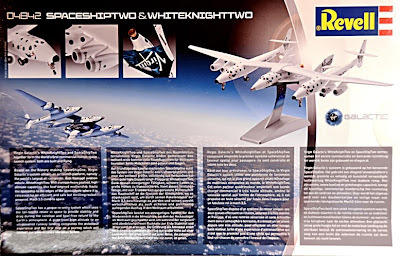 Mat Irvine: The previous post on this 1:144 scale WhiteKnightTwo-SpaceShipOne kit gave most of the details, but as I helped Revell out with some details, advice, and a check-though of test shots against instructions, here’s a bit of background. In all you get five runners (below) three in white styrene, two in clear. 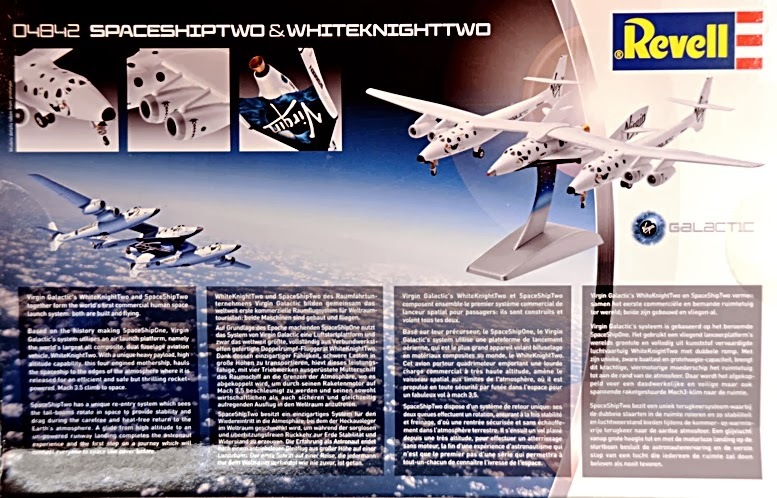 However, because WK2 is in effect two aircraft joined together, two of the white runners are identical, as are both the runners moulded in clear plastic. Because many of the parts are identical, and plenty of them are very small, it is vital to pay close attention to the instructions, and not to remove parts from runners until they are required. This applies especially to the two WK2 fuselages, and the four engines, as at first glance, many components look identical. 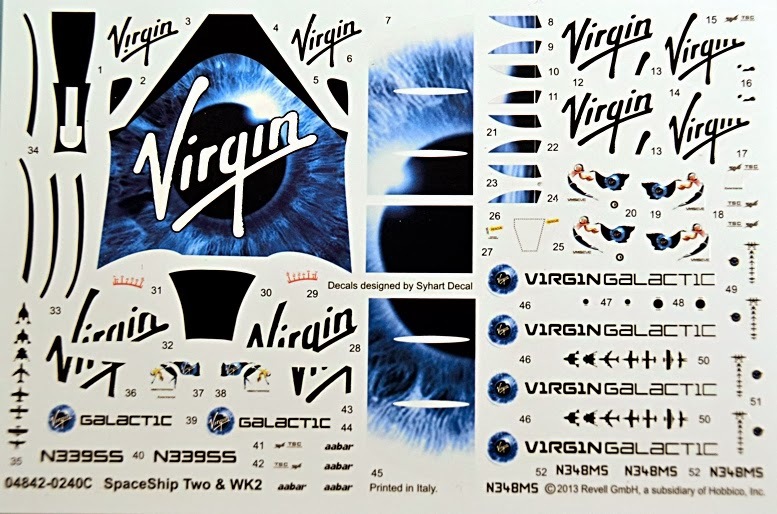 The decal sheet has comprehensive Virgin Galactic markings. Note the centre ‘stripes’ are intended for the stand. The model can be built with landing gear for both craft retracted or lowered, and in either instance the completed model can be placed on the supplied stand. 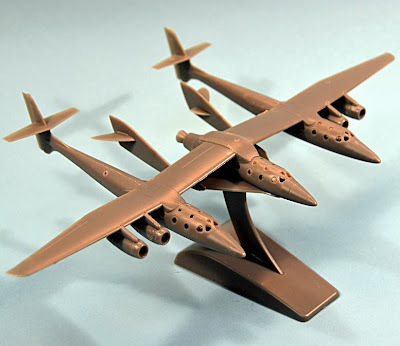 Alternatively, with undercarriage lowered, the aircraft can be displayed on their wheels, in which case weights are needed in the forward fuselages for balance. 10gr are recommended for WK2, 5gr in SpaceShipTwo. As a third option, either craft can be placed on the stand, the other on the ground. Note these pictures were taken from my assembled test shots, with grey plastic. The kit as sold is moulded in white, and even though the real thing is predominantly white, many modellers will still want to top this with a spray finish. To this end the most of the assembly can be done first, after which the model can be sprayed. But, just as with airliner models, there are the windows to consider. 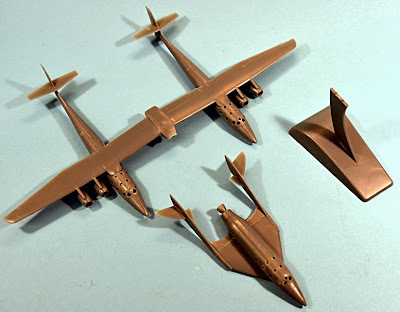 These have to be installed before the fuselage halves are joined together, so you are faced with one of three options to get a proper paint finish. 1 Assemble as much as you can, but leave the WK2 fuselage halves separate. Then paint, install windows, and finally join together. 2 Assemble the whole kit, with the windows installed, then cover these with a masking fluid from Humbrol or Revell, before applying the spray paint finish. 3 Omit the supplied ‘glass’ altogether, and finish the model without them. Then paint and add windows using Kristal Klear from Microscale Industries. This is a PVA-based substance that is applied as a white liquid which turns completely transparent when dry. Kristal Klear is limited as to the exact diameter of window it will fill, really no more than a few millimetres, but is ideal here, as the largest porthole in the WK2/SS2 duo is only about 3mm across. 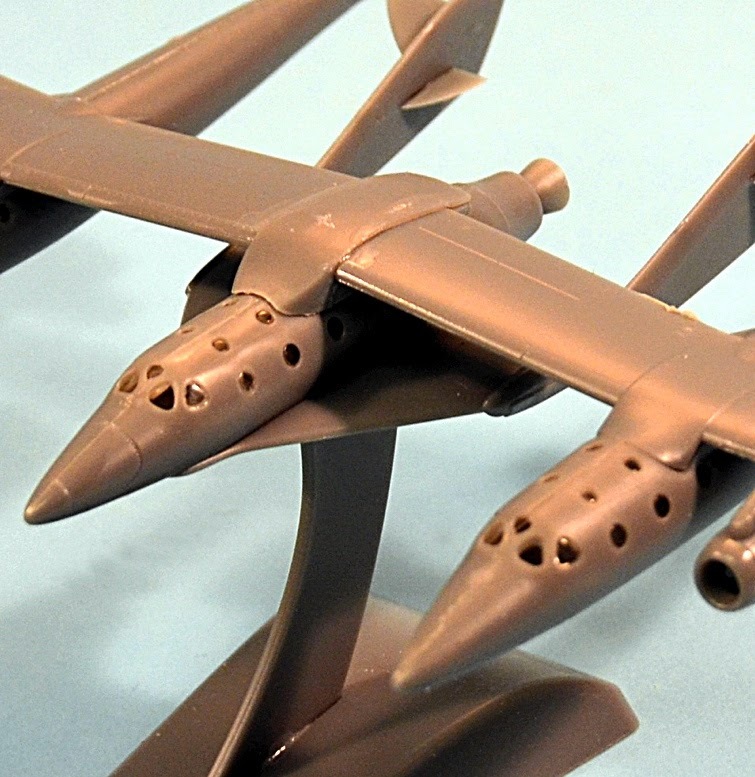 The kit's 1:144 scale matches the standard ‘space launcher’ scale, and of course the standard airliner scale. 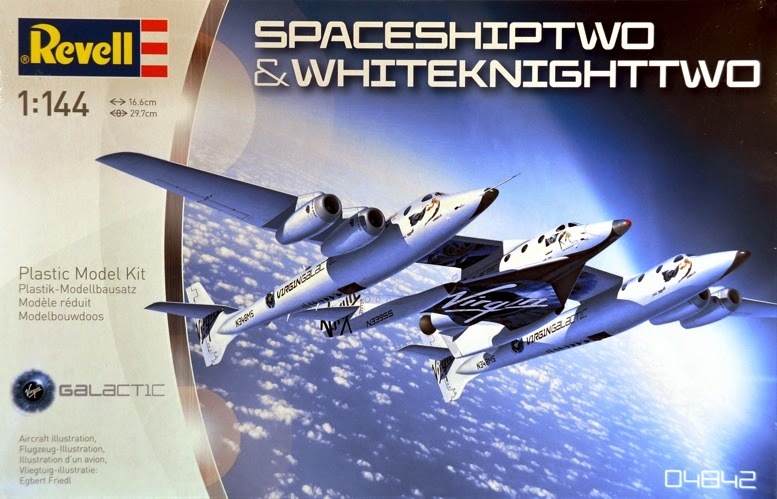 However it's not the traditional 1:72 aircraft scale, which would also complement the two existing SpaceShipOne and WhiteKnightOne kits, from Unicraft in resin, and A-Model in styrene. 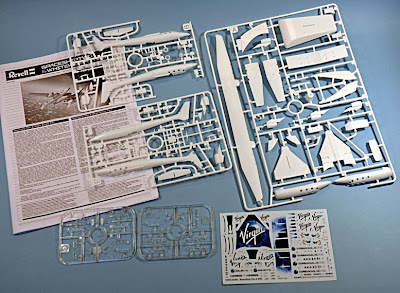 However, there have been rumours that Revell may enlarge this kit to 1:72 scale, when you would have a model with a wingspan of almost 600mm (23.6in), which would certainly make for an impressive finished display piece. The box (below) is a design in which you extract the components by opening either end; you don’t get a traditional separate lid and bottom. 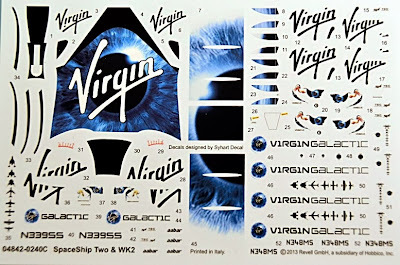 One last thing - the long-winded SpaceShipOne and SpaceShipTwo names are Virgin Galactic-speak, so that’s the way we have to write them, though it’s something of a relief to use the shortened acronyms SS1 and SS2! 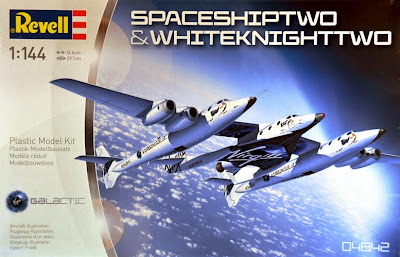 Revell 1:144 scale Virgin Galactic SS2 and WK2.